When you do high bar squats at the gym, how are your neck and back feeling afterward? Do you experience a lot of tightness and pain trying to be a superhero in the gym? In this video, I’ll show you how to prevent those problems by showing you how to perform the low bar squat, a safer alternative that more effectively distributes loads than the high bar squat does. One variable that makes a huge difference in the safety of performing any kind of exercise is form, and the squat is no exception. 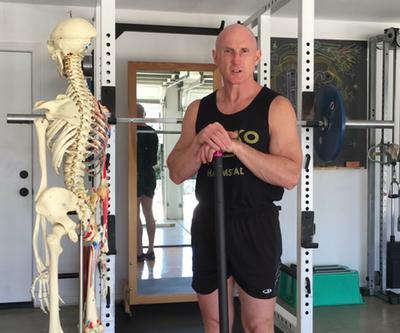 If you don’t monitor your form — especially if you’re leaning forward too far — the load of the weights or just an Olympic bar (45 pounds) by itself can create pressure around the end of the spinous process creating shear forces that produce inflammation in the facet joints along the spine. This starts impinging on the nerve roots and irritates muscles trying to brace for the impact which cuts down on circulation and leads to more complex problems and joint laxity. Although the low bar squat can be tricky to learn, the beauty of it is how your shoulder blades and scapula can work in tandem to support the bar. If you have a hard time performing the low bar squat, that means your body is already out of balance. In How to Eat, Move and Be Healthy, you’ll find 20 stretch tests that will help you identify and correct those imbalances with the correct stretches. You’ll also learn an important tip in this video about the placement of your feet when doing squats that will help you maintain proper form as well as your optimal center of gravity. 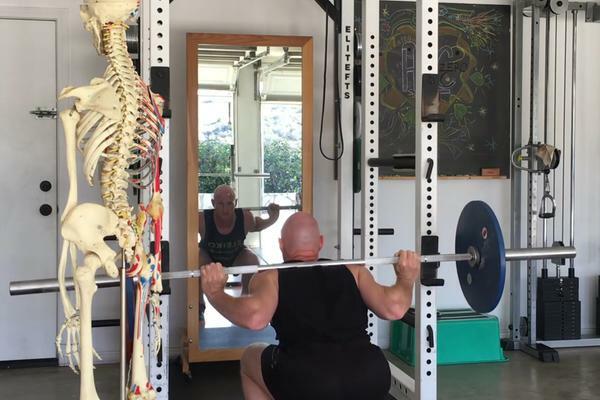 If you want to learn a lot more squats, including a comprehensive assessment of technique and proper form, our Scientific Back Training course contains a lot of information about relevant anatomy, physiology and biomechanics, plus corrective and strength exercise instruction.